Today we are celebrating the upcoming summer solstice. Summer solstice will arrive, in Toronto, on June 20th at about 7pm. What does that mean? Summer solstice is the longest day of the year and the true kick off of summer. That seems like a pretty good reason to celebrate to me! 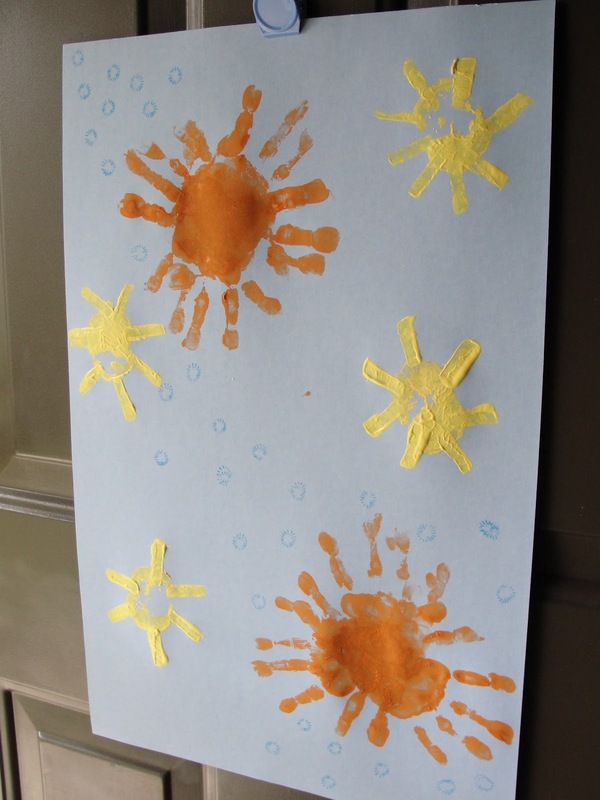 We decided there was no better way to welcome summer and the sun then to create an art piece for our front door. We designed an ode to the sun using 3 different stamping techniques. One of my favourite blogs is Maya Made and she recently showed readers how to use a poppy flower pod as a stamp. 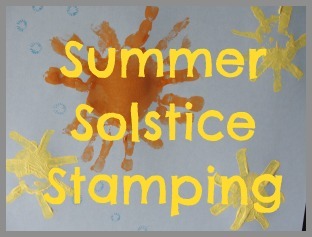 The poppy flower stamp creates a lovely little sun shape. Perfect for our summer solstice door hanging. It’s a simple as cutting your poppy, when it is done blooming. Stamp the pod into an ink pad and stamp onto the paper. Another easy stamping technique. Start by brushing the paint onto your child’s hand. Stamp your hand, or child’s hand, onto the paper. Rotate the paper, or the hand, and repeat until you have sun shape you like. Have your child draw a circular shape onto half of a potato. Carve around the circle shape and cut away the excess potato. We also used a small slice of potato for the sun’s rays, but you could cut the entire sun shape out of the potato. Cut a handle into the backside of the potato, this makes it easier for little hands to do the stamping. Pour paint onto a plate, a flat surface. Dip the potato into the paint and then stamp onto the paper. By using these three different stamping techniques my daughter was able to create a multidimensional piece of art. We used a magnet to hang the artwork on our front door. We are totally thrilled with the end product. Do you celebrate the summer solstice? How will you be celebrating? Thanks for the reminder about solstice! Love the sun hands! I love the handprint suns! Oooh we did poppy seed stamping a while back and thought it was wonderful 🙂 love your crafty post! oh, poppy seeds – fabulous! I can’t decide which I like more! Thanks so much for sharing!